Between 1938 and 1969 a group of 45 designer/printmakers in the neighborhood of Folly Cove, MA emerged, as one of them put it, “out of the granite of Cape Ann.” Depicting their local environments with passion and humor, the group—mostly women—worked together to cut carefully wrought designs into linoleum, print the designs on fabric, and sell them as table linens, draperies, and clothing. Their founder and leader was Folly Cove resident Virginia Lee Burton Demetrios, a well-known children's book author and illustrator. Though few in the group self-identified as artists, they produced work of great beauty, complicating as others would the divide between art and craft and between individual and collective production. 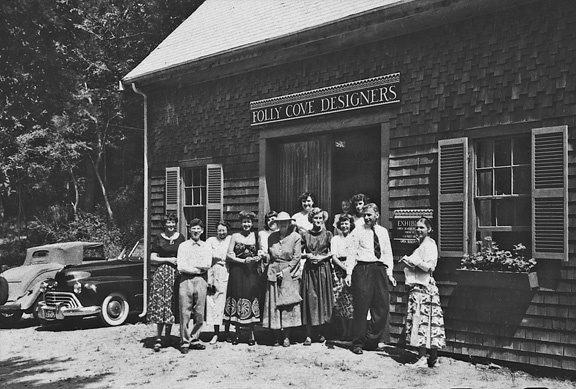 The Folly Cove Designers and their work provide a valuable glimpse into the world of handicrafts and handicraft practitioners in coastal New England in the interwar, wartime, and postwar years and insights into a variety of issues, including immigrant life, gendered work, and the nature of community. Jennifer Scanlon, an historian whose scholarly focus is U.S. women’s history, is Interim Dean for Academic Affairs and Professor of Gender, Sexuality, and Women’s Studies at Bowdoin College. Her book Bad Girls Go Everywhere: The Life of Helen Gurley Brown was named a “Book of the Times” by the New York Times and a business book of the year by American Public Media’s Marketplace. Her most recent book, Until There is Justice: The Life of Anna Arnold Hedgeman, is the first biography of that stalwart civil rights leader, educator, speaker, social service worker, policy maker, and politician. Professor Scanlon serves as a Distinguished Lecturer for the Organization of American Historians and has served as Executive Director of the Coordinating Council for Women in History (CCWH), an affiliate of the American Historical Association (AHA) and the Organization of American Historians (OAH). This event is free and open to the public and is in conjunction with the exhibition Keeping Busy: Five Contemporary Artists Respond to Henrietta Lambie’s Mourning Quilt c.1884, curated by Esther S. White. The Contemporary Art at Historic Northampton program is supported by a generous grant from the Art Angels Fund at the Community Foundation of Western Massachusetts. The Space Between: Rediscovering the Folly Cove Designers was published by The Massachusetts Review in the Summer 2015 issue. England material culture united them across class and ethnic backgrounds. Their artistic and commercial success printing their designs onto textiles energized and legitimized their group, both as a collective of women and as an artist’s cooperative. The essay argues for the Folly Cove Designers (active 1938-1969) to be seen as a forerunner of the women’s groups and professional organizations that fueled feminist social change in the following decades.